This is one of my favorite images, not because it is some amazing feat of photography, but because of the emotions and the “real moment” that was captured. Allison and Mike made a special stop on their wedding day to visit Allison’s terminally ill grandfather. Seeing the looks on her grandparent’s faces as Allison walked into their family room; they were so proud of their granddaughter. Clearly a real moment and well worth the stop in the couple’s busy day. See the rest of the images from Allison & Mike’s wedding. Shoot & Share does an annual internal contest based on multiple different categories. 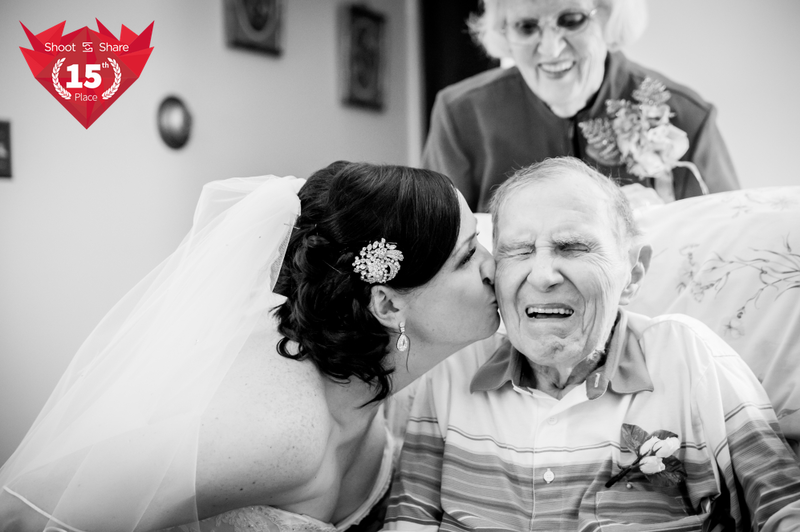 We entered the above photo of Allison and her Grandfather into their “Real Moment” category and won 15th place of thousands of submissions. Sad to say Allison’s grandfather passed away a few weeks after this image was captured.